"The higher purpose of my images is to be a voice of the ocean and for the ocean, hoping that people can get a glimpse of who they really are, beautiful, sentient individuals, with feelings and different personalities, with complex behaviors and interesting lives that science is only starting to understand." Christian Vizl is more than a diver, and more than a photographer. Born in Mexico City, Vizl speaks of his deep connection to the ocean and its wildlife since his earliest memories of childhood. An advocate for environmental awareness and protection, Vizl aims to spark love and empathy for marine life through his photographs, and puts his connection with the animals he encounters before the work itself. I spoke with Vizl by email about the challenges of underwater photography, how he uses monochromes like black and white and sepia, and what he feels when he looks back at his photos. Cailin Loesch: You have such a fascinating history as a diving instructor, cave diver, rafting guide, and sailor. I guess, really, what ties it all together is your love of the ocean and the water. When did you first realize you were so drawn to the ocean? Christian Vizl: Thank you! Yes, definitely—I have a deep love for the ocean and water, but also for all nature both above and below water. Every since I was a kid, as far back as I can remember, I've been attracted to the sea. I dreamt about what lay beneath the waves, and how it would look if suddenly all the water vanished, leaving in stasis all the animals and living creatures. This way, I could walk inside the ocean and see them all, suspended for a moment in time and space. CL: I would guess that an underwater shoot requires even more planning than other kinds of shoots, because, obviously, you are doing it underwater, while in the middle of a dive, and you can’t predict what kinds of creatures you will come across down there. What is going through your mind as you set off to do a shoot? Do you have an idea in your head as to what kind of shot you want to get, and of what? CV: Absolutely, underwater photography requires a lot more preparation and planning. First, you need to be at least a competent diver and very comfortable in the water. I plan my shoots and my trips by looking for a specific animal living in the wild in the best possible conditions as far as water visibility, my likelihood of becoming close to the animal, interesting behaviours ocurring in a particular area [that I might come across], etc. But I try not to have any fixed ideas in my mind. To be honest, my main goal is to be in the presence of these amazing animals that I photograph and have some kind of connection with them; images come second. Once I'm in the water with them and enjoying their presence, then I start to look around, searching for beauty—especially in terms of lighting. Photography is all about light, and in my opinion, it is the single most important aspect when it comes to creating appealing, inspiring and touching images. Beyond technical issues, what's most important is how I apply and manipulate the light that's available in order to create pictures with dramatic effect, carrying depths of emotion and using contrast and tonalities as means to emphasize form and structure of the scenery. I focus on the emotional impact of the final shot that will connect on a deeper level with the people that observe these photographs. Just as a poet uses words to create poetry, a photographer uses light to create images. So when I’m underwater taking pictures, one of my goals is to create poetic images through the use of light. CL: You have such a beautiful and unique style to your work. I wonder how you would describe your photos to someone who has never seen them before. CL: Who do you count among your biggest influences? Is there any one photographer or artist that inspired you to become one yourself? CV: Definitely! So many, but to name a few: David Doubilet, Ernie Brooks, Ansel Adams, Sebastian Salgado, Peter Beard and Nick Brandt. CL: Some of your photo series are in black in white, others in sepia, and others in full color. How do you decide what colors you want to use in each photo? Is there a certain feeling or vibe that you feel sepia conveys, versus black and white, for example? CV: When I was a kid and started taking pictures, my first rolls of film were always black and white, because I was always fascinated by the emotional capabilities within the lack of color to convey depth of emotions. So, naturally, most of my first underwater images where also black and white. 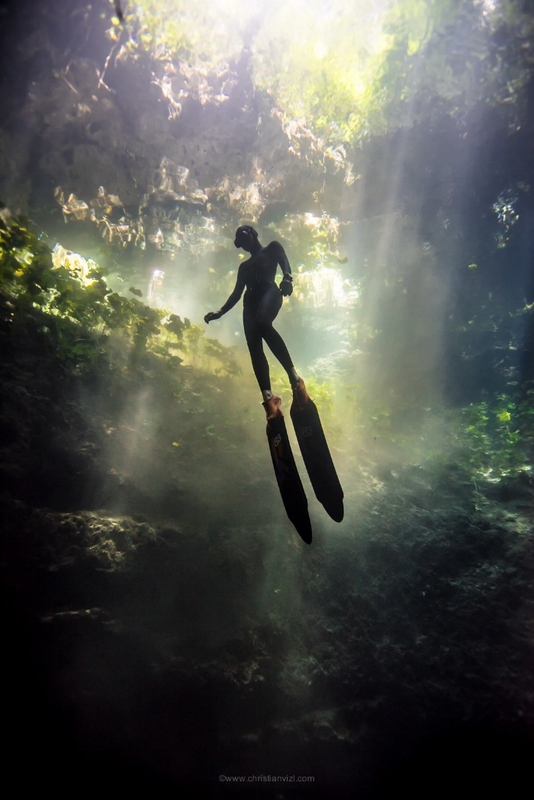 But there are certain animals or ecosystems, like the mexican cenotes which display such an incredible palette of colors, that I think it would be a great loss for the image to take them out. My sepia series is the newest one, because after so many years of creating black and white images I found myself in need of exploring a new style. It's a way of keeping myself interested and challenged in my photographic career. What I found in sepia is the depth of emotions that I always loved in b&w but with a much warmer feeling to the whole scene, which fascinates me! CL: When I look at your underwater photos, I get a deep sense of tranquility. What do you feel when you look back at what you’ve shot? CV: So many different emotions! Yes, always tranquility, but also gratitude because I feel very fortunate to have been in the prescence of so many beautiful and amazing animals. I also feel a lot of love for them and very proud to always try my best to show their natural beauty and awesomeness to many people around the world who would probably never be able to meet them firsthand, or at least in the wild. CL: Is there a certain view of the ocean that you want people to walk away with when they are first familiarized with your work? Are you on a mission to make them see it in a particular way? CV: The majority of humans see marine animals merely as tons of food, but I see them as so much more than that. They don't have a voice that we can understand, so the higher purpose of my images is to be a voice of the ocean and for the ocean, hoping that people can get a glimpse of who they really are, beautiful, sentient individuals, with feelings and different personalities, with complex behaviors and interesting lives that science is only starting to understand. I have devoted my life to exploring and contemplating the amazing beauty of the ocean, and it has been an incredible journey that has brought me a deep feeling of connection with nature. But, sadly, during my lifetime I have witnessed the ever-increasing devastation that we humans are creating in this planet. Today the world’s oceans are in grave danger. Overfishing, pollution, plastics, radiation, climate change, acidification and other human pressures threaten the fundamental nature of the ocean and its animals are being pushed to near extinction. The time to act and reverse our negative impact is now, before it´s too late and we risk losing everything. CL: You’ve been able to do what so many people dream of doing, which is turn their passion into a lifelong career. What would you say to someone who wants to do a similar thing, but doesn’t know where to start? CV: To find their own passion and what they really want to do in their lives. Then figure out if they have a natural talent for that particular craft. Then stop thinking and worring about money and devote as much time and effort as they possible can to that particular passion, because that is the way they can create something valuable for the rest of the world. Apr 27 Street Photographer Pau Buscató: "This demands being fully aware of what's going on around you"